Cut down entire legions of enemies when the over-the-top action of the Dynasty Warriors series meets the characters and settings from The Legend of Zelda universe. In the Hyrule Warriors Legends game, launching for the Nintendo 3DS family of systems on March 25, nearly the entire Wii U version of Hyrule Warriors can be played in the palm of your hand! And this new portable version of the top-selling action game even contains some added features, such as new playable characters, the ability to switch between characters on the battlefield, new stages and a fun new mode that lets players level up their own fairy. The action-packed gameplay from the Hyrule Warriors game returns in Hyrule Warriors Legends. By playing as classic characters from The Legend of Zelda series, players use over-the-top, visually satisfying moves to battle their way through massive stages full of hundreds of enemies. The deep combat system and wide selection of weapons can be used to clear each stage and take down towering bosses. Multiple modes in the game allow players to play through the game’s intriguing story, battle on a map inspired by The Legend of Zelda for NES and replay favorite levels to find hidden collectibles. Hyrule Warriors Legends introduces new characters to the Hyrule Warriors family. Making her debut in the game is Linkle, a girl who wields two crossbows and lives in a small village filled with Cuccos. Also joining the large cast of playable characters is the mysterious Skull Kid from The Legend of Zelda: Majora’s Mask, as well as many fan-favorite characters from The Legend of Zelda: The Wind Waker, including Toon Link, King Daphnes and Tetra. Each one of these characters possesses her or his own weapons, special moves and abilities. The introduction of new characters also brings the addition of new stories, stages and maps. 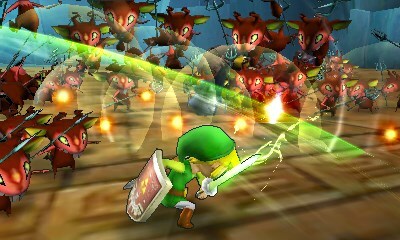 Two new stages with elements based on The Legend of Zelda: The Wind Waker are included in Hyrule Warriors Legends, with recognizable set pieces like the Forsaken Fortress showing up in select stages. By choosing to play as Linkle, players can experience a new story in Hyrule Warrior Legends from the awesome heroine’s perspective. For the first time in the series, players can switch between and command multiple characters in each stage. This strategy can be used to quickly jump around the map, or even to take down tough bosses by thoughtfully placing characters at strategic positions on the battlefield. In addition, two important new items are added to the mix in Hyrule Warriors Legends. The Ocarina lets players warp to different owl statues located around the various stages, while the foreboding Hammer can be used to smash things, including troublesome enemies. Another new feature in Hyrule Warriors Legends is the ability to level up a personal fairy. Fairies offer powerful magical abilities that can be used in battle. By equipping a customizable fairy, players can use Rental Skills that offers various effects, like attacking enemies with fire or healing the character’s HP. Players can even dress up their fairy in different outfits, accessories and makeup. Starting March 25, players can buy a season pass to get access to four DLC packs and a bonus costume for Ganondorf that’s exclusive to Hyrule Warriors Legends. These packs will also be available for purchase individually in Nintendo eShop during the next few months, but players receive a better value by purchasing the season pass. Medli from The Legend of Zelda: The Wind Waker will also be available as a free download starting when the first DLC pack is released..
Every physical and digital version of Hyrule Warriors Legends will include two download codes: One for a Hyrule Warriors Legends Nintendo 3DS HOME Menu theme and another for transferring characters. The character transfer code will allow purchasers who also own Hyrule Warriors for Wii U to use Ganondorf’s Trident weapon and play as the five new characters from Hyrule Warriors Legends in the Wii U game. People who use the transfer code will be able to download these characters to their Wii U game right away. People who only own the Wii U game will be able to purchase the additional content as DLC this summer. By tapping any amiibo figure or card to the New Nintendo 3DS systems (or the Nintendo 3DS, Nintendo 3DS XL and Nintendo 2DS systems using the Nintendo 3DS NFC Reader/Writer accessory, which is sold separately), players can receive weapons, Rupees and other surprising bonuses in the game. By using amiibo for characters from The Legend of Zelda series like Link, Zelda, Sheik or Ganondorf (each sold separately), players will have a better chance to receive weapons rated 3 stars or higher.